My Only Christmas Knitting – again | Wound Up Tight! Posted on December 29, 2012 by Wound Up Tight! Once again, I had only one knit Christmas gift to give this year. But it was an awesome one. A few weeks ago, I was with my sister, and I thought I heard her say she liked that new trend of giant oversized knit stuff. Now, I’d had a beer, and I couldn’t remember if she said she liked it, she wanted it, she thought it was ridiculous, or what. All I got out of it was “oh good, I can make that!” As I plugged along, I wondered if I’d mis-heard, or if I made it up altogether in my desire to make one of these things. But I figured what the heck. Either she’ll be happy or very very confused, but it would be fun either way. It was knit with unspun wool top, split in half. 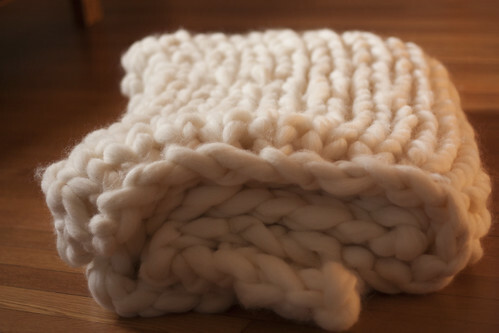 (You could knit it with it just as it comes, but really that’s more art installation than blanket. I tried it.) At 4 st per FOOT it worked up really quickly. I think there were 20 stitches/row. It took about 6 hours on 1.5″ PVC pipes with some really classy duct tape covering the openings. Scooter thought it was pretty dope too. My Sister loved it. She draped it over her and walked about. We decided she looked very rich wearing her blanket. I have photos. As she will soon be a wildly expensive lawyer, I will not put those photos up here so she doesn’t then sue me for defamation. But it was a hit. 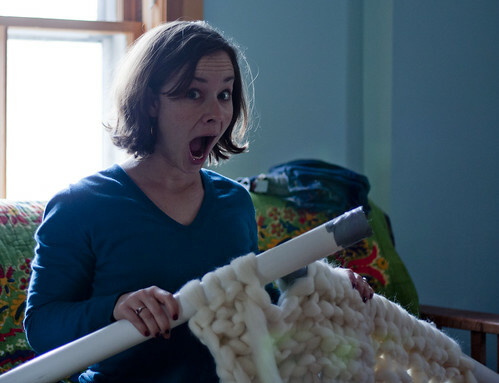 This entry was posted in Cats, holidays, knitting and tagged christmas gifts, giant knit blanket, knitting with PVC pipes, wool top by Wound Up Tight!. Bookmark the permalink. Wow! I’ve always wondered how to make those super large blankets. Where do you get an unspun wool top? Are they pricey? I wanna do this! Hi Jess! You should do it. PVC pipes are a few dollars, and the unspun wool, I love Copper Moose (www.coppermoose.com) – he has tons of breeds, really good prices, and Bill is a super nice guy to boot. 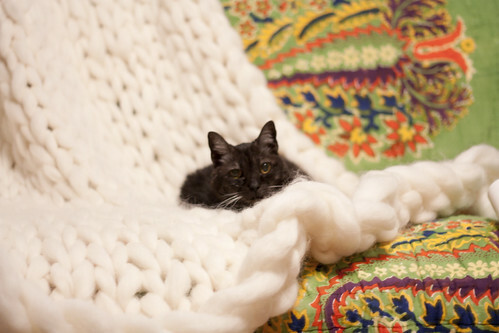 I think my blanket was ~ 3 lbs, so somewhere $30-50 depending on what wool you like. Do it! Oh wow, that’s totally do-able then! Ok. I’ve got to get a few things off the needles before I can justify this, but I’m totally gonna do it. 🙂 Thanks for the info, and the link! how will you wash that? wont it felt and stretch out of shape?.. curious ! how long did this project take you? i think these blankets are so gorgeous and i’m dying to take on the challenge of the pvc! Probably about 8 hours total. Very quick, definitely give it a go!